File in use on Windows – how to find the responsible process? But the most important question is: By WHOM is the file in use? There are just 2 applications on Windows which will help you finding the originator. Both are available from www.sysinternals.com. The first one is handle.exe. You can start handle.exe and provide a path to the file or folder which is in use. Make sure to start the tool with administrative rights! The process which keeps an open file handle is sapstartsrv.exe, process ID 4256. In some cases, handle.exe fails to find open handles. Therefore I use Process Explorer. Again, make sure to start the tool with administrative rights! The file “SAPevents.dll” is in use. SUM upgrade therefore stopped, because it’s not possible to delete this file. Process Explorer tells the truth. SAPevents.dll is in use by sapstartsrv.exe. Scenario: SUM upgrade of a SAP system. SUM stops: SAPevents.dll should be deleted, but the file is in use. Who is “svchost.exe”? It’s a so called “Service host” from the Windows OS, which hosts several Windows services. It must be one of the listed services. In theory it can be any of above services. In this special example we’re looking for a service which keeps a handle to SAPevents.dll. So, it should be the Windows EventLog? Why is SAPevents.dll in use by the Windows EventLog service? 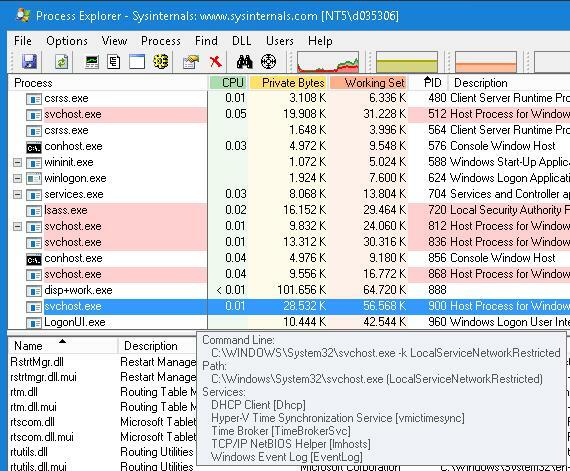 Everytime when you open Windows Event Viewer and load the Application log, the Windows EventLog service will load SAPevents.dll to display SAP specific errors, warnings, information and their description. Therefore sapevent.dll is in use by svchost.exe which hosts the EventLog service. The solution here is to close the Event Viewer or to restart the Windows EventLog service.